By Allah’s Grace another calendar year is about to end. According to Bylaws of the Islamic Center of Naperville, we must hold elections each year to elect replacements for the members whose term would be expiring at the end of the year; and elect new members of the BOARD OF DIRECTORS for the next two years. ICN Board comprises of 9 Board Members and elections are held every year for board members who’s term is expiring end of that year. For 2018 Elections are for four(4) board members. As members of ICN, it is our privilege and obligation to participate in this ongoing process of determining our leadership. 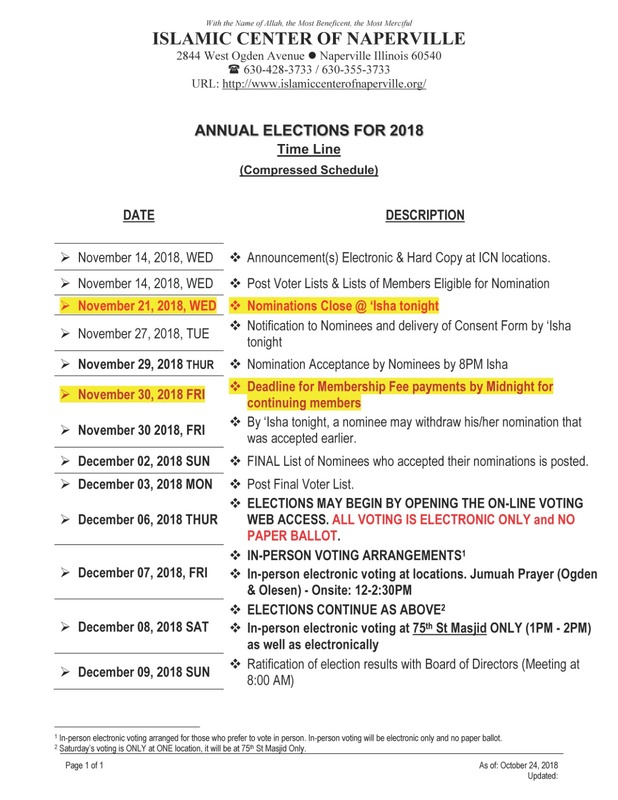 To be eligible to vote you must be a Voting Member in good standing who has paid his/her current year’s ICN membership dues in full by five days prior to election day which would be Friday November 30, 2018 midnight. New members must pay their Membership 150 days prior to the voting day to be eligible for voting in the Annual Elections for the Board of Directors and at General Body Meeting. NOMINATORS AND NOMINEES WILL BE REQUIRED TO CLEAR THEIR MEMBERSHIP DUES AT THE TIME OF SUBMITTING THEIR NOMINATION FORMS AND ACCEPTING THE NOMINATION, RESPECTIVELY. A Nomination Form is attached and uploaded to the ICN website. Click here to download the Nomination Form. The deadline for submitting Nomination Forms is by ‘Isha on Thursday, November 21, 2018. You are allowed to nominate a maximum of 4 candidates ONLY. Nominations over 4 candidates will be rejected. Election Committee’s decision shall be final in this regard. Spouses cannot vote in behalf of each other. Please honor this rule, especially since we are providing an Electronic Voting Facility. We are striving to make the process as user-friendly, efficient, fair and robust as possible, Insha’Allah! Despite our best efforts, if you think we can do better please feel free to fill out the suggestion form available at ICN Masajid and drop it in the suggestion box. Due to introduction of ELECTRONIC VOTING, there will be no Absentee Ballot provision for 2018. REMINDER: Membership fee is $50 for each individual (there are no family memberships any more). Payments should be made specifically for the purpose of membership. Membership payment.